Pokemon’s North American International Championship is quickly approaching and in less than a week, Pokemon players will descend upon Indianapolis from around the globe (but mostly from the United States) to battle to try to be the first player to win the North American International Championship, Pokemon’s largest event of the season. The National Championship being converted into an International Championship isn’t the only change this year, unlike past years, where the National Championship meta game was mostly blind and built upon local tournaments and foreign National Championships, this year there have been multiple Regional Championships and Special Events for the meta to be hammered out, so this year’s tournament will have a much more developed meta game than previous years. Based on the results of recent tournaments, here are what I believe are the Top 10 decks that players will see at the International Championship this weekend. The most hyped deck headed into the International Championship is undoubtedly Zoroark BREAK/Drampa GX. Following a Top 4 performance at the Wisconsin Regional Championship, Daniel Altavilla was able to win the Regional the next weekend in Mexico City with the same 60 card list. A week later, Sina Ghaziaskar won the Special Event at Origins with the deck. The deck uses Drampa GX as an early game power hitter, boosting the damage on its Beserk attack to 180 by getting damage counters onto your Zorua and other pokemon with Team Magma’s Secret Base. 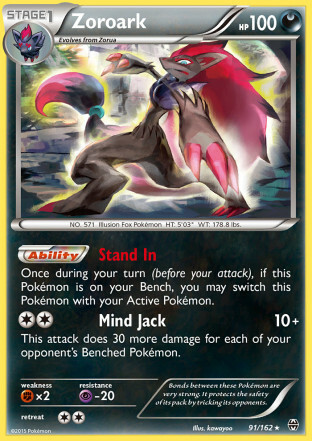 The deck then uses Zoroark’s Mind Jack, which hits for more relevant numbers in this format because of Choice Band. 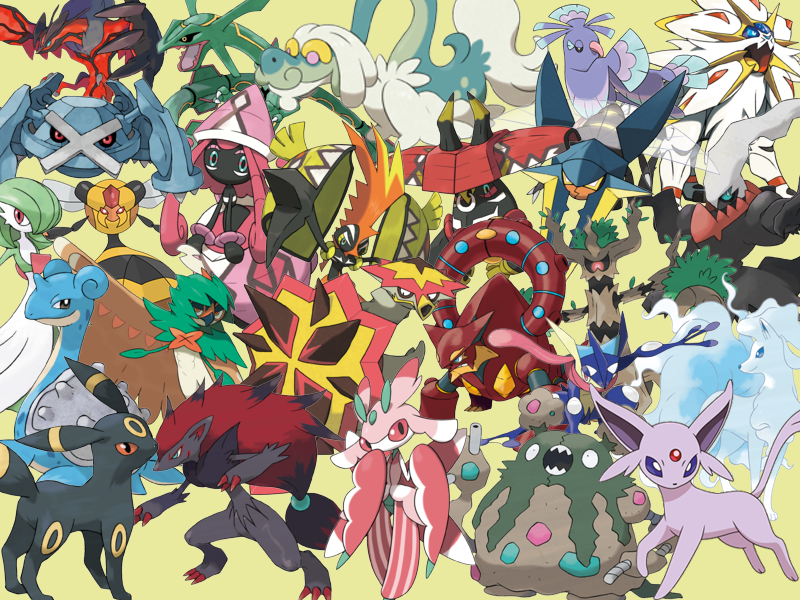 With the release of GX Pokemon, we have seen lots of new strong attacks introduced into the game. Zoroark BREAK copies these attacks with Foul Play and turns it back on the opponent. Zoroark BREAK can copy attacks like Tapu Bulu GX’s Nature’s Judgment and swing for OHKO’s all for a single Darkness Energy. The deck has a few difficult matchups like Metagross GX and Greninja BREAK, but it is somewhat insulated from these decks as some of the other top decks in the format are strong against those decks, limiting their potential, and thus causing them to not be a very large part of the meta. Some players have taken action against Metagross GX decks by including Flareon AOR in their lists. I’ve seen it played as both a 1-1, as well as a 2-1/1, with the 1 of split being an Umbreon GX. Some players will also play a dedicated Umbreon GX/Zoroark deck instead of Drampa GX, but these players will be in the minority and the vast majority of Zoroark players should be playing the Drampa GX/Magma Base version of Zoroark. Outside of some bad matchups against some of the more fringe decks, I don’t think this deck has very many weaknesses, and it will likely be one of the most popular, as well as one of the top performing decks of the tournament. 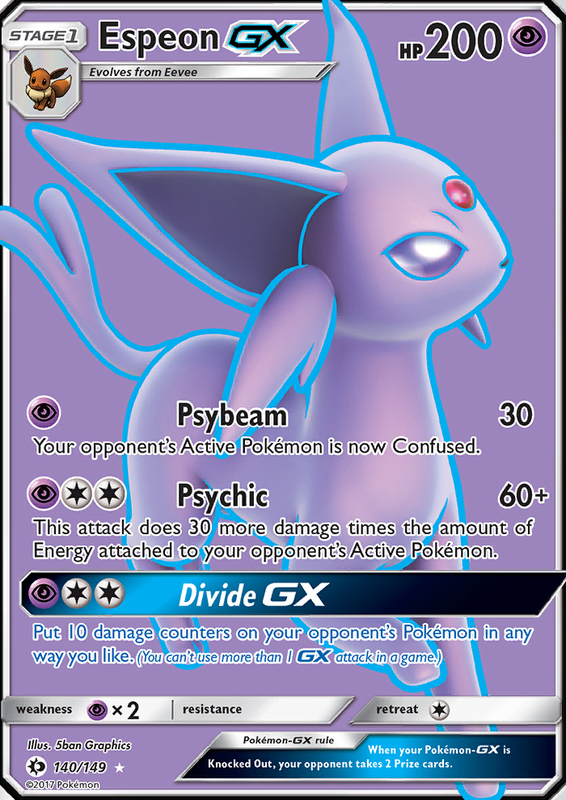 While this was considered the inferior Garbodor variant at the beginning of the format, Espeon GX/Garbodor has claimed its spot as the best Garbodor deck in the format, as it possesses good matchup coverage, and it appears to be the variant best suited for Garbodor mirror matches. When the deck first emerged on PTCGO prior to Seattle Regionals, it seemed like a very gimmicky version of Garbodor, but as lists have developed I think players have begun conceptualizing just how good confusion is in this format, and how much it can aide you in getting your opponents to play more Items. Either they do something to get out of their confusion, risk taking 30 damage and losing their attack for the turn, or doing nothing, which is fine as well, as you can then pummel them with Psychic. 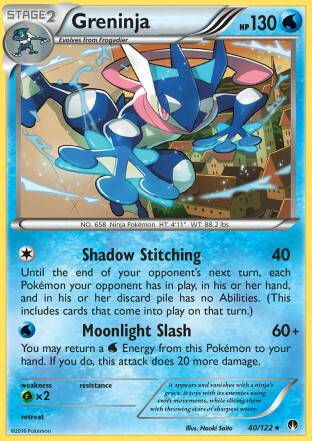 The deck plays Garbotoxin Garbodor in addition to Trashalanche, so the deck provides a major annoyance against Ability based decks like Vikavolt/Tapu Bulu GX, Metagross GX, and Greninja BREAK. In the majority of games I’ve played against these decks, they struggle to overcome the Ability lock. These decks are all packing Field Blower, typically in multiple copies, but in forcing the opponent to chase an Item card to get back their Abilities you will typically force them to have to play or discard more Item cards, which powers up Trashalanche for you. Standard Espeon GX/Garbodor lists usually play a copy of Hex Maniac, so you can also use Hex Maniac to lock Abilities on turns where you anticipate your opponent may be able to counter Garbodor for that turn, as well as an early game Ability lock option. If I had to pick a deck to be the most popular deck in the tournament, I think this would be it. While I expect this to be the most popular deck, I also expect there to be a large number of players that get distracted with some of the hyped decks and don’t pay enough respect to Garbodor, causing them to be crushed by Trashalanche at the tournament. One hot tech that players should strongly consider is Flareon AOR, which will turn Espeon GX and Garbodor into Fire type Pokemon allowing you to score OHKO’s on Pokemon such as Metagross GX or Lurantis GX. After being forced to take a vacation when Decidueye GX/Vileplume became the best deck in the format, Vespiquen/Zoroark came back with a vengeance, with Jeffrey Cheng netting a 2nd place finish in Seattle with the deck and then Michael Pramawat winning the Wisconsin Regional the next weekend, giving Vespiquen its first major win of the season. The primary card that Vespiquen gained from Guardians Rising is Choice Band, which helps Vespiquen get to higher damage numbers earlier in the game. Choice Band also makes Zoroark a much stronger alternative attacker, helping it hit much more relevant damage numbers. The big question for any wannabe Vespiquen player for the weekend is how much Oricorio should they expect, and this is going to be a big mystery headed into the tournament. After Pramawat’s Regional win, it seemed like people were putting Oricorio in almost all of their decks. Now that we’re a few weeks out from that win, it seems that Vespiquen is diminishing in play at League Cups as players are fearful of getting countered by Oricorio. With Vespiquen seeing less play, players may try to gain an advantage against the rest of the meta game by cutting the Oricorio for something that is useful in other matchups that they are more likely to play against, and if people cut their Oricorio, all of a sudden Vespiquen becomes a really good play for the tournament. I don’t expect Vespiquen to be played in large numbers, but I do think there will be a contingent of players that cast their lots with Vespiquen in an attempt to win it all. In a theoretical meta game where players aren’t playing Oricorio’s at the International Championship, Vespiquen would be the best deck in format and there wouldn’t even be a close second. Drampa GX took the format by storm, completely dominating the Seattle Regional Championship, taking up 17 of the 32 Day 2 slots at the tournament, with Sam Chen eventually winning the tournament with the deck. Since then the deck has naturally seen a decrease in play as players adjusted to playing decks that are better suited for playing against it. Additionally, Espeon GX/Garbodor is typically seen as the superior Garbodor variant. With that said, Drampa GX/Garbodor still has a sizable presence in the meta game, and it is also still a very powerful deck and one of the best in the format. Like Zoroark BREAK/Drampa GX, the deck uses Drampa GX in conjunction with Team Magma’s Secret Base in order to attack for 180 damage with Beserk as early as Stage 2. It uses early game aggression with Drampa GX in an attempt to force the opponent to scramble for resources as they try to deal with the Drampa GX, which can force them to play or discard Items as they try to keep up. Once there are enough Items in the discard pile, the deck shifts over to attacking with Trashalanche to finish out the game. While I think Espeon GX/Garbodor will be the most popular Garbodor variant, I still expect Drampa GX/Garbodor to see a decent amount of play. The Garbodor deck split will probably be something like 65% Espeon GX and 35% Drampa GX variants. Headed into the International Championship, there are actually two variants of Volcanion EX decks. The first is the classic version that plays Hoopa EX, Shaymin EX, and Max Elixir for a speedy setup. The other version is a slower version that relies on Brooklet Hill and Tapu Lele GX to get setup. I’ve found the Brooklet Hill version of the deck to be better for this format because of a much improved Garbodor matchup compared to the Max Elixir variant. The Brooklet Hill works very well in the deck, not only searching out your Volcanion EX, but also searching out Staryu for you, allowing you to easily get your pre-evolution for Starmie into play. With Choice Band in the deck instead of Fighting Fury Belt, the deck is able to more consistently take OHKO’s as it’s less reliant on Steam Up, but it also can use Choice Band to hit for higher damage numbers. The other big addition to the deck with Guardians Rising is Turtonator GX. Its Bright Flame attack can hit for 190 with Choice Band, which means you can use it to OHKO a lot of stuff, even under Ability lock. 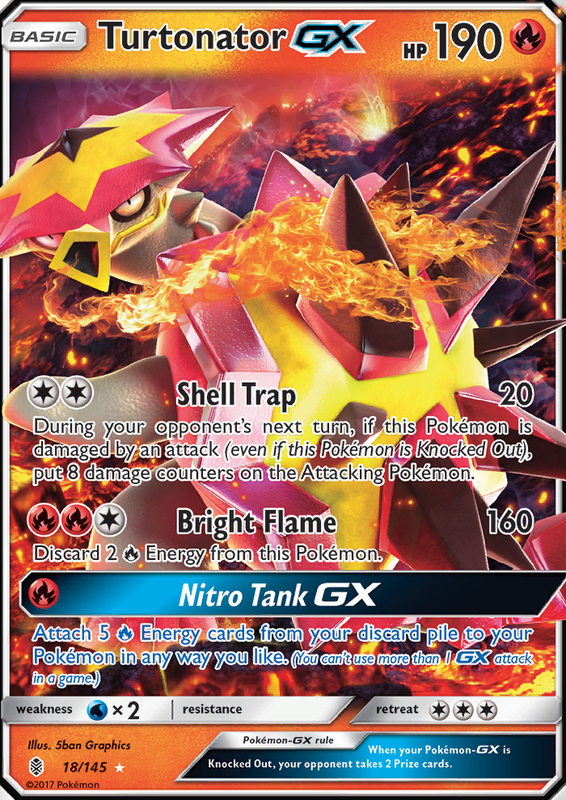 Its Nitro Tank GX attack is also terrific for getting Energy attached to your Pokemon to finish out a game. With 190 HP, there are also situations that arise where Turtonator GX becomes the preferred attacker solely because that extra HP is protecting it from being OHKO’d. Like other Ability based decks, Volcanion has also gotten Field Blower to remove a Float Stone from Garbotoxin Garbodor allowing it to use Steam Up again. While there are Water Pokemon being played in the format, with Vaporeon AOR in Vespiquen, Greninja BREAK, Alolan Ninetales GX, and Lapras GX’s Waterbox, none of these decks are all that popular, so Volcanion has solid positioning in regards to its Weakness right now, although having your day dampened by a type counter is possible. The Weakness game also works in Volcanion EX’s favor some, with it being able to hit both Decidueye GX and Metagross GX decks for weakness making for some easy OHKO’s in those matchups. Decidueye GX/Vileplume was the undisputed BDIF of the previous format, but Guardians Rising significantly hurt the deck archetype. With the release of Tapu Lele GX and Garbodor, decks are now being built with less of a reliance on Item cards to get setup, lessening impact of Vileplume’s Item Lock. Some of the attacks in Guardians Rising are also brutal against the deck. 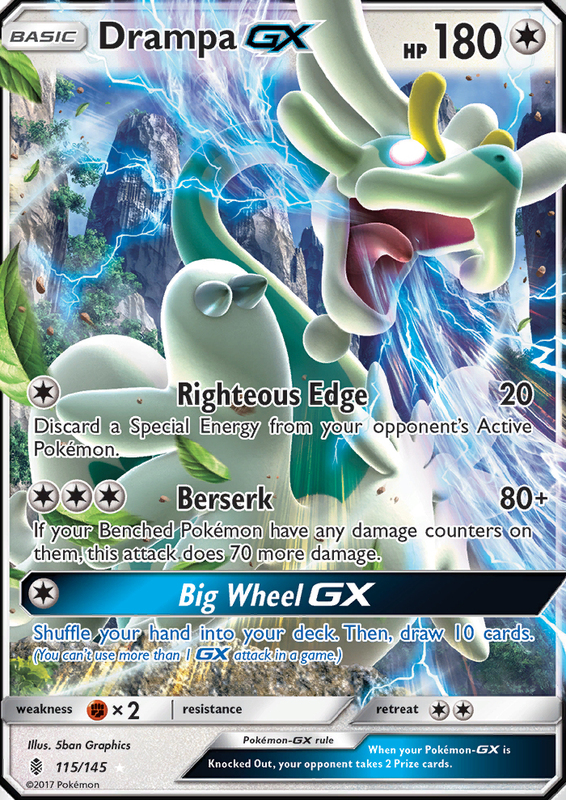 Drampa GX’s Righteous Edge removes the deck’s Double Colorless Energy, which has proven difficult for the deck to deal with. Additionally, the deck plays a lot of Item cards, and it typically needs to use lots of them to get setup, so this makes Trashalanche very strong against the deck. Additionally, Flareon AOR is standard in Espeon GX/Garbodor decks right now, so Decidueye GX decks are being hit for Weakness by one of the most popular decks in the format, in addition to Volcanion. Nonetheless, Item lock can still be very powerful, especially in a format where players are insistent on trying to get away with playing Rare Candy again. While I’m skeptical of Greninja’s recent online hype, if that does pick up in play, that should be good news for Decidueye. There are two main variants of Decidueye GX that have been seeing play this format. The first uses Alolan Ninetales GX as an attacker, using its Ice Blade attack to snipe 50 damage anywhere on the opponent’s field. 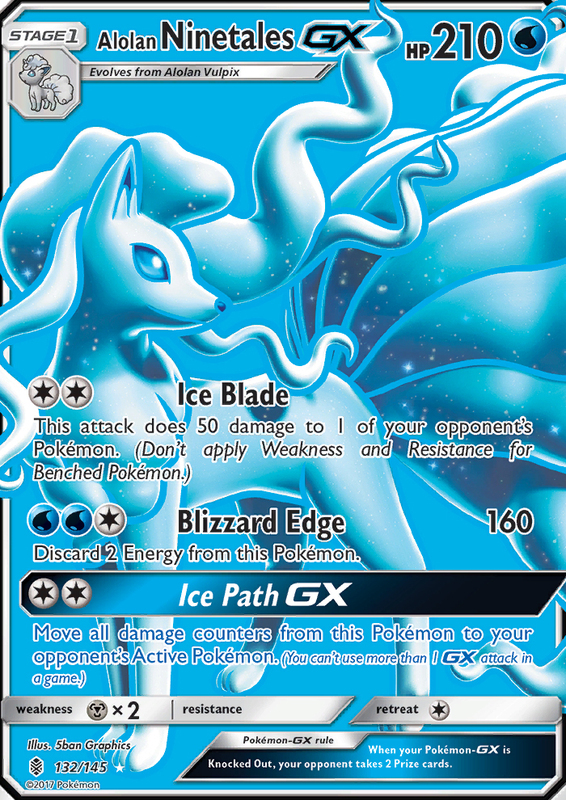 If your opponent hits into Alolan Ninetales GX, it can also use its Ice Path GX attack to take all of its damage counters off itself and place them onto the opponent’sActive Pokemon. As the deck plays Alolan Ninetales GX, it also plays Alolan Vulpix, which helps you search out your evolutions. One of the nice things Vulpix lets you do with the deck is that it lets you evolve into Vileplume early, even without Decidueye GX’s setup, as you can then search our the Decidueye line pieces with Alolan Vulpix. Previously when you evolved to Vileplume without setting up the rest of your field, many games ended in you not finding the pieces to continue evolving and then dead drawing and losing. The second variant that has been seeing play is a Big Basic version, typically playing multiple copies of Drampa GX. Top 8 Wisconsin Regional Championship. I think that these are the six most powerful decks in the format, and after these decks I think there is a significant drop off in quality with the rest of the decks on this list. I also think it would be appropriate for a second line in between Drampa GX/Garbodor and Volcanion EX, as I think the Top 4 decks are at a noticeably higher power level than both Volcanion EX and Decidueye GX at this point. The primary issue I have with most of the other decks on this list are that they are non-Forest of Giant Plants Stage 2 decks, which means that they can be inconsistent in getting setup. While Stage 2’s are much more consistent thanks to Tapu Lele GX, Brigette, and Skyla, they are still significantly less consistent than Basic and Stage 1 decks. In a tournament where you will likely need to be 7-2 to move onto Day 2, I would be weary of playing most of the decks below for fear of losing a pair of matches to just never getting setup, and then other matchups due to bad matchups. Taking losses to both inconsistency and bad matchups will leave a very thin margin of error for players piloting these decks at the touranment. Of the non-Forest Stage 2 decks in the format, this is my favorite as it is the most aggressive and also the most consistent. The deck is very similar to the Emboar/Rayquaza EX deck from a few years ago, using the same concept of using a Stage 2 Energy acceleration Ability to power up a powerful OHKO attack on a Basic Pokemon. 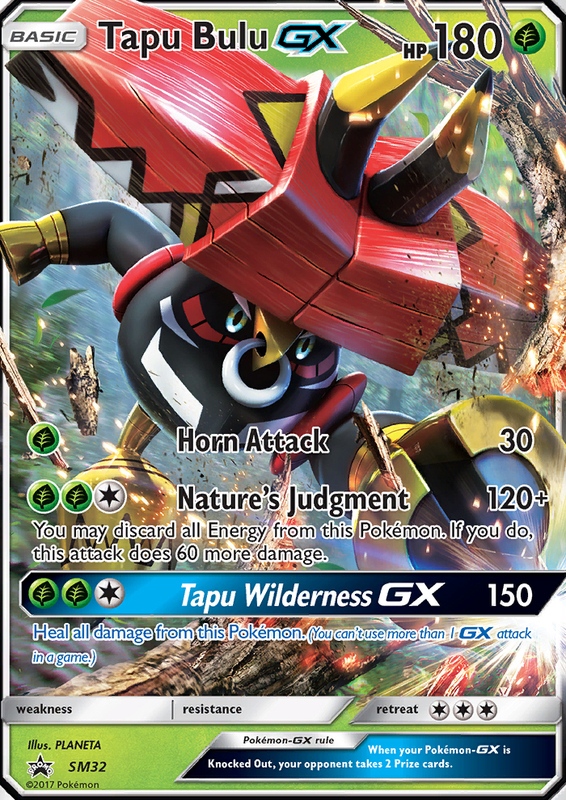 Tapu Bulu GX is a powerful attacker, with its Nature Judgment attack being able to hit for 180 if you choose to discard all of the Energy attached to it, which can become 210 damage with a Choice Band,. The deck is a little different from Emboar, however, as Emboar attached Energy from the hand, while Vikavolt searches two Energy out of the deck. 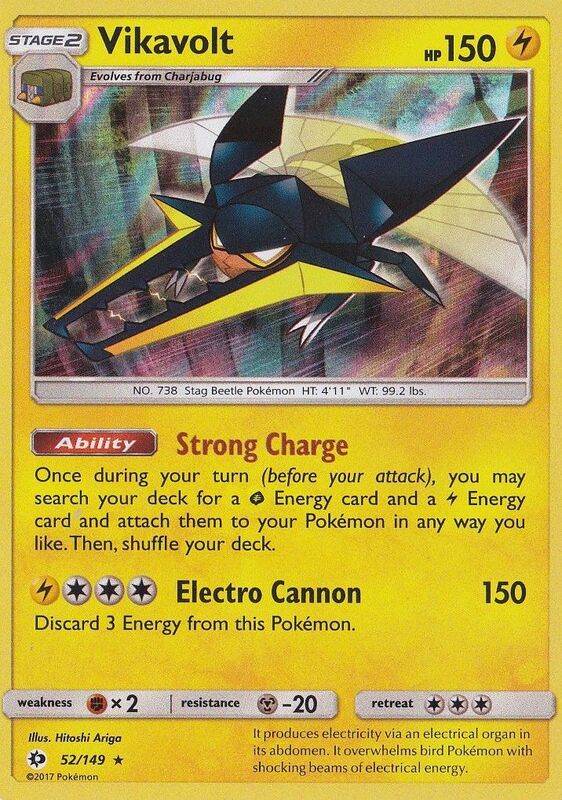 I think Vikavolt’s Ability is better, as pulling Energy out of your deck helps thin your deck and by removing Energy cards from your deck with the Abiility, you make it more likely to draw into the cards you actually will need later in the game. Another advantage this deck possesses over the Emboar decks is the versatility of Tapu Bulu GX’s attack, which also lets you hit for 120 damage if you don’t want to discard your Energy, which can knock out lower HP stuff as well as 2HKO EX and GX Pokemon. Tapu Bulu’s Tapu Wilderness GX is also very strong, completely healing off Tapu Bulu GX, while also hitting for 150 damage, which can become a 180 damage OHKO if you have a Choice Band attached. If any of the Rare Candy Stage 2 decks were going to take home the tournament this would be the one I would think has the most potential to win it all. 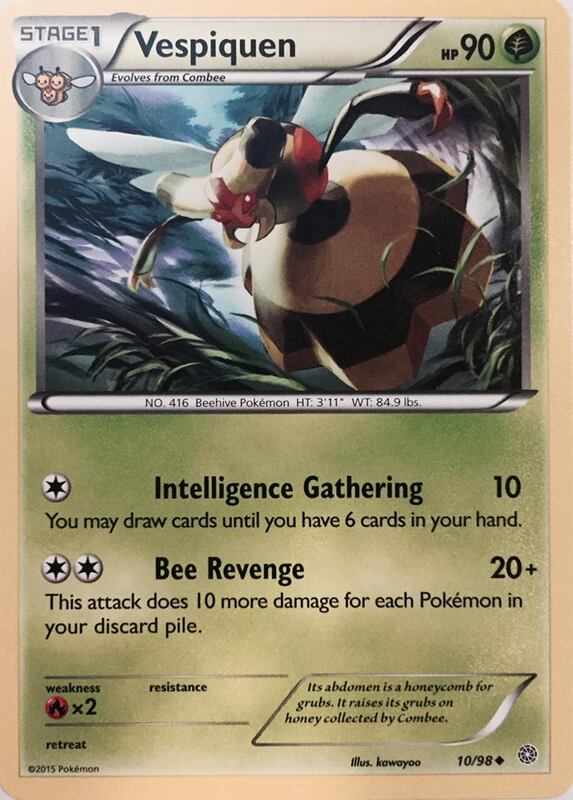 The other big Rare Candy based Stage 2 deck in the format is Metagross GX. 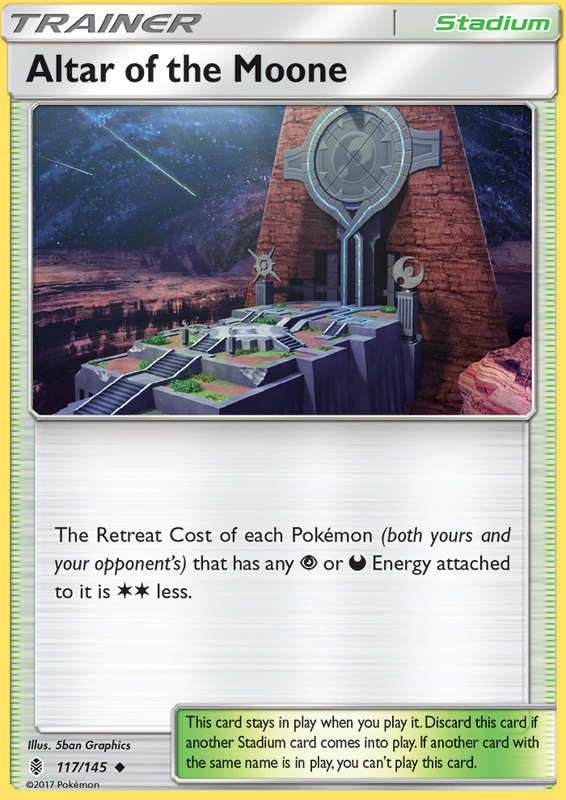 While Metagross GX doesn’t have as much OHKO potential as Tapu Bulu GX, it attempts to take advantage of the format by tanking hits with its 250 HP, and then healing itself off with Max Potion, before re-accelerating the Energy with Geotech System. The deck typically plays Alolan Vulpix GRI as a starter Pokemon that they use to search out the Pokemon they need for their setup. Some players also include the Alolan Ninetales GX, as it has Colorless attacks and they’re already playing the Alolan Vulpix, but most lists do not use space for this. Another common card that has popped up in recent weeks is Mimikyu. 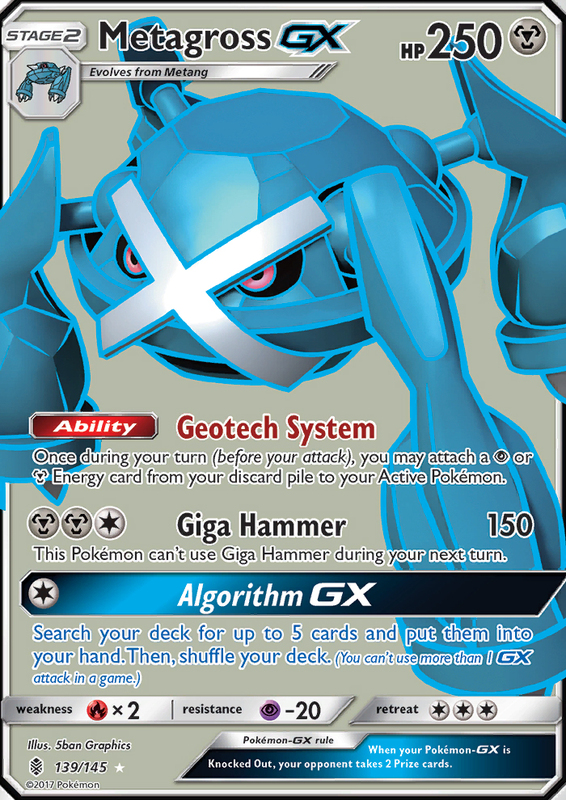 Its Filch attack can be used to aide in Metagross GX’s setup, and its Copycat attack can be used to copy opponent’s strong attacks. As they actually have to use the attack first, the card can be played around fairly easily, but it does give the deck a one prize attacker that can mix it up for big damage. I don’t think Copycat is that effective of an attack, and the one prize Pokemon space is probably fulfilled by Alolan Vulpix in aiding in your setup. If you want a one prize damage attacker in the deck Cobalion STS seems like a better option anyhow. 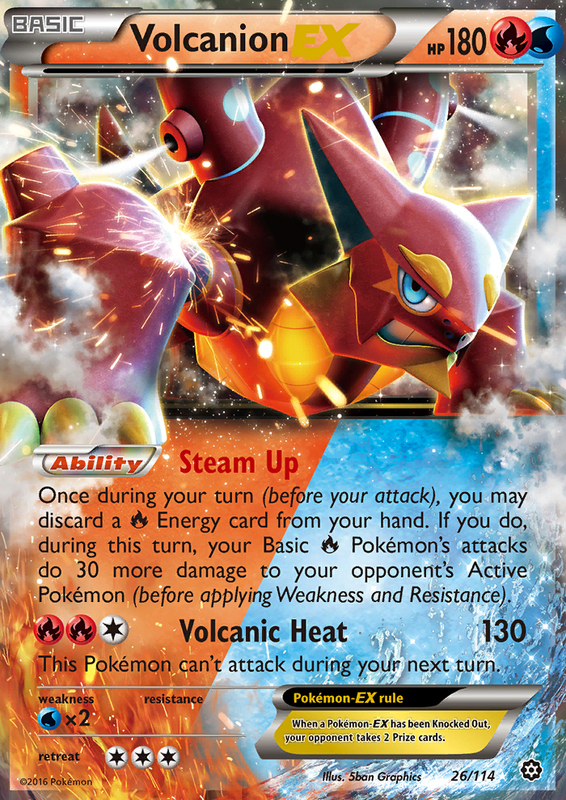 The biggest issue that Metagross GX will face at the tournament is decks turning to Fire type options to help shore up potentially bad matchups against it. Almost every Espeon GX/Garbodor deck will be playing Flareon AOR, which will make that a pretty bad matchup, Vespiquen will also be playing Flareon, and then Volcanion EX is just all Fire already. If enough Zoroark decks tech in Flareon lines, the field starts looking even worse for Metagross GX, just based on its Fire type weakness. *Recommended to drop from deck. Turbo Darkrai EX was in an interesting spot following the release of Guardians Rising. The old school, very speedy Hoopa EX, Trainers’ Mail, Max Elixir and Exp. 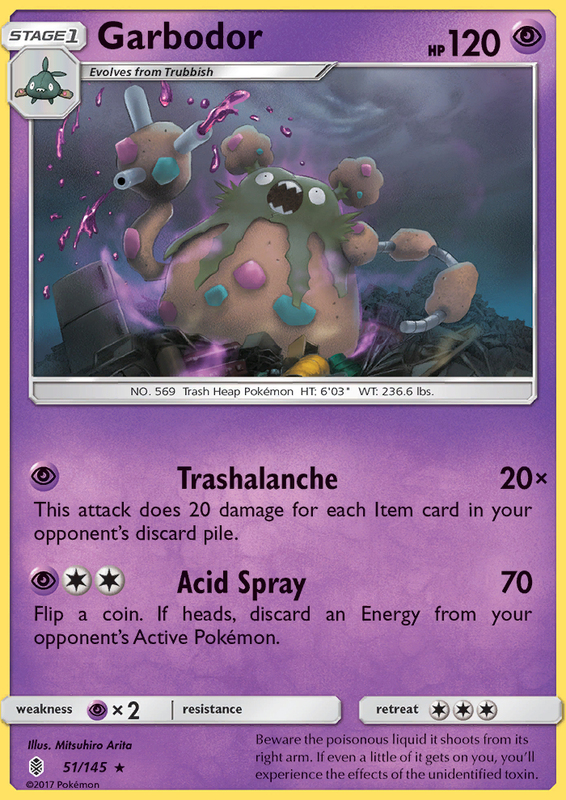 Share variant of the deck was dead on arrival, as blowing through Items like that for your deck to function guaranteed that you weren’t beating Garbodor. It’s probably safe to drop the Turbo from the deck name and call it Darkrai EX/Yveltal at this point. While Garbodor and Field Blower certainly do damage to the deck, it also gained some stuff to make it better. Choice Band makes it so that the deck can reach higher damage numbers with less Energy on the field. This also boosts the damage of Oblivion Wing Yveltal, making it so you have to do less damage against EX and GX Pokemon to finish them off with Darkrai EX after poking into them with Oblivion Wing. 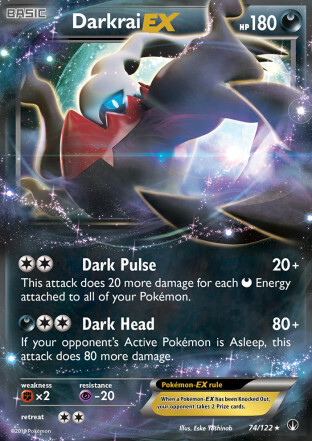 The deck also gains Altar of the Moone, which makes it easier to switch between Darkrai EX and Yveltal, and also to switch between different Darkrai EX to prevent knockouts. Field Blower does fairly significantly hurt the deck, however. Being able to knock off Exp. Share can sometimes make it so Darkrai EX no longer is hitting the damage numbers it needs with Dark Pulse to take knockouts. Darkrai EX is also a lot easier to knockout without having the 220 HP it had with Fighting Fury Belt. Hitting 180 damage is much easier for decks like Vespiquen than 220, and decks like Metagross GX and Tapu Bulu GX both easily reach this damage output. Drampa GX, which is found in both Zoroark and Garbodor decks can also reach 180 damage with a Choice Band. The last deck that players should expect to see at the tournament is Greninja BREAK. This was one of the most hyped decks headed into the format as it got Field Blower to remove tools from Garbotoxin Garbodor, and it also got Choice Band letting it hit for better damage numbers. However, despite the hype, the deck fell flat when it came to Regional Championships. Zero Greninja decks were able to make it into Day 2 at either the Seattle or Wisconsin Regional Championships. It was only in Mexico City, with a generally weaker playerbase, and a smaller tournament field that Greninja BREAK did see success, with Alex Krekeler playing it to a 4th place finish, with two other players also finishing in the Top 32 with it. A week later, at the Origins Special Event, Greninja also failed to make it into the Top 8. The biggest knock on Greninja headed into the International Championship is inconsistency. The deck has a tendency to not setup, causing it to lose games. In a tournament where you will likely need to go 7-2 or better to move onto the second day of play, picking up losses to not getting setup is not a recipe for success, when you will also likely take a loss to a bad matchup or two throughout the first day of Swiss. Even the Mexico City results do not bode well for Greninja. Two of the Greninja BREAK decks, including the Top 4 finisher went 6-3. The other Greninja BREAK deck went 6-2-1, but had the lowest resistance of any of the 6-2-1 players. This means at a larger Regional, none of these Greninja decks would have made it into Day 2, and 18 and 19 points falls well short of what would be needed to advance into Day 2 at the International Championship. The biggest point of disagreement with Greninja is its Garbodor. Some players view the matchup to be in Garbodor’s favor, while others tend to find it in Greninja’s favor. I find myself siding with Garbodor in this matchup. Garbotoxin and Hex Maniac both help to keep it in check in the matchup, and then Greninja also tends to play or discard lots of Item cards in its setup, which makes Trashalanche be able to hit for OHKO’s. I think what happens for a lot of Greninja players is that they solely focus on the games where everything worked as they desired, and tend to ignore the games where they had to use Professor Sycamore dumping a bunch of Items to avoid getting benched out. In addition to a questionable Garbodor matchup, the deck is also very sketchy against grass decks like Vespiquen, Decidueye GX/Vileplume, and Vikavolt/Tapu Bulu GX. I tend to think that Greninja is receiving hype as an attempt for people who plan on playing Grass decks, such as Vespiquen, to influence players into playing more Greninja tha should be played, creating a softer field for these decks at the tournament. As far as how Greninja is being built these days, it typically is playing Talonflame, and some players are even playing Rare Candy. Silent Lab is still the Stadium of choice, although Brooklet Hill and Rough Seas are other options. 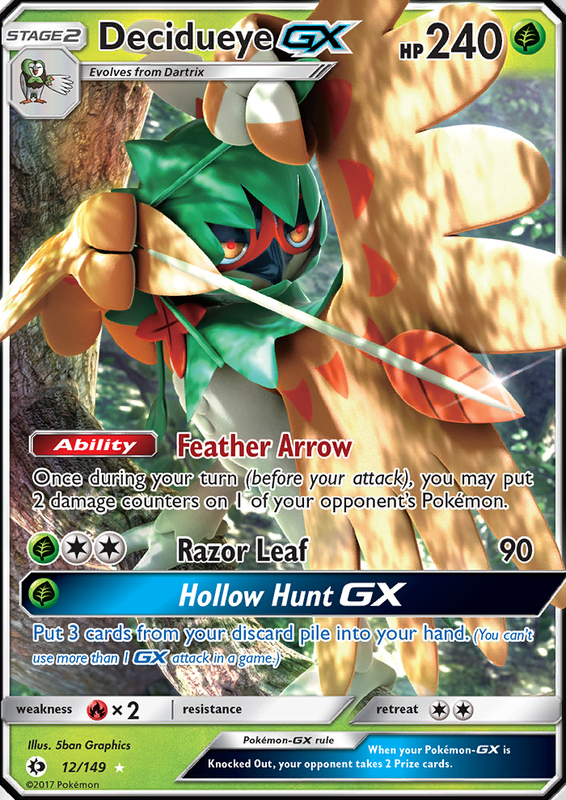 Talonflame BREAK has been included in some lists, in particular Alex Krekeler’s, to hit Decidueye GX for Weakness if you start Talonflame. While it doesn’t make the matchup favorable, it does give Greninja BREAK a more realistic shot at pulling off the upset. No Greninja/Talonflame decklist available from a major event. Will update with the Mexico City Top 4 Greninja list if Pokemon.com posts the lists prior to the International Championship, or if I find a suitable list from a contributor before then. These are just the Top 10 decks that players should expect to be played at the International Championship. In addition to these primary decks, there are fringe contenders that are many players’ pet decks that they may bring to the tournament, decks such as Lurantis GX/Tapu Bulu GX, M Rayquaza EX, Umbreon GX/Zoroark, Alolan Ninetales GX, and Waterbox, among others. More likely than not, the winning deck from the International will come from these 10 decks, either in their existing form or a new variation of one of them, although it is possible that one of the format’s fringe decks is being undervalued and takes the tournament by storm as well. We are in uncharted waters for US Nationals (or North American International Championship to be more accurate). In past years, it has been a mostly blind meta ripe for lots of surprises. This year, with so many Regional Championships and Special Events already played within the format, along with League Cups, it will be interesting to see if there are any surprises left for the International Championship.